I have been following The Sartorialist (www.thesartorialist.com) for years now, watching him highlight people with unique style in fashion capitals around the world. When I lived in Florence, I regulary wondered if I’d bump into Scott Schumann at the Pitti or the Duomo. When we moved back to Canada, pictures of Florence’s stylish hotties (of all ages) helped heal my homesickness for Italy. Julia Roberts in 2001, wearing Vintage Valentino. The designer has said that dressing Ms Roberts for this event has been a career highlight. … I got a brain flash! Wouldn’t it be awesome to show stylish peoples wearing a main item of clothing acquired according to the Stephens’ Sisters Shopping Diet Principles?!! Organic, local, sustainable, second-hand, ethically made. If none of the above, then clothes from countries with stellar human rights records. Quality, so you replace your stuff less often. 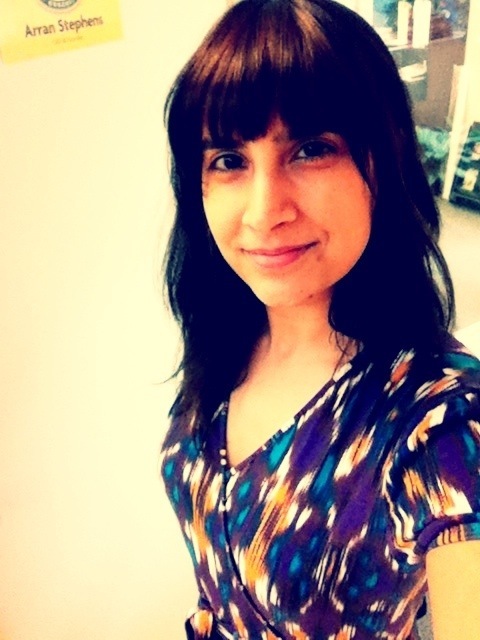 To kick off, here is Jyoti at the office. Her dress is Value Village Vintage. I acknowledge that some people don’t want to clothe themselves in the energy of strangers. My mother, born in India, is one of those people. She asked me to say this when I told her I would blog about The Diet. 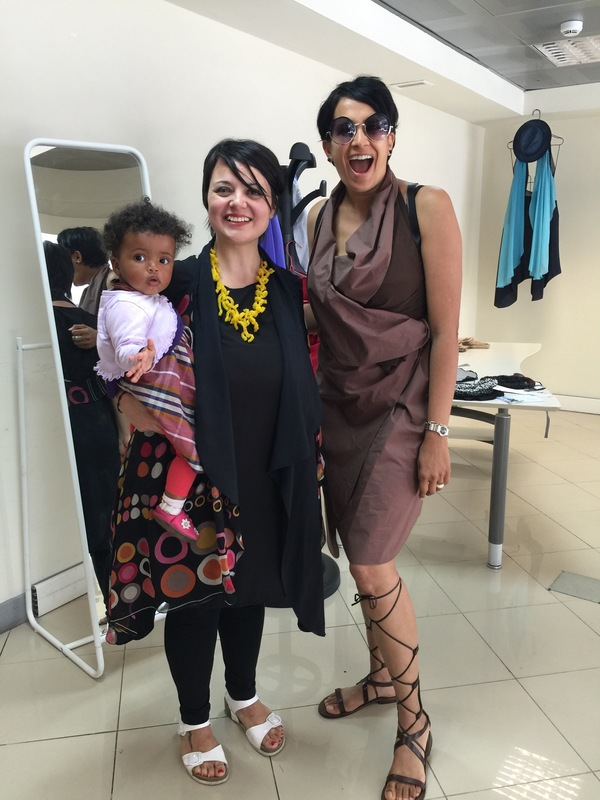 In India, there is a taboo about buying other people’s cast-off clothing. Fortunately, being born in Canada and being half English, I laughed off that cultural idea when I was young. Wearing clean, second-hand clothes that fit your style can be super cool, sustainable, hip and exciting to shop for. The quality of many well-made vintage clothes is such that they have lasted decades. Clothes back then were were made to last years, not a season. I hope to make The Diet Style Shot a regular – if not frequent – section of my blog to celebrate those people who can rock your grand-dad’s clothes. This entry was posted in Fashion, Jyoti Stephens, Stephens Sister's Shopping Diet, Style-Diet Shot and tagged Buying organic local sustainable, buying quality, Canada, Cheesecake Etc, Clothing, Edith Sims, Florence, Italy, Jyoti Stephens, Rome, Sartorialist, Scott Schuman, Stephens Sister's Shopping Diet, Style-diet Shot, Thomas Jefferson, Thrift shopping, Value Village, Vancouver, Vintage on May 14, 2013 by Gurdeep Stephens. When we lived in Firenze’s Le Cure neighborhood, we were spoiled rotten for hand-made gelato, from Cavini to Badiani and a few in-between. Taking a post-dinner passeggiata (stroll), we would lazily amble about in the evening sun and eventually turn a corner and then find… Bliss. Moving back to Canada’s West Coast was bittersweet in general and definitely sour when it came to locally-made ice cream. I had given up even after I had read an article last year about some non-Italian Vancouverite who had won an international prize for gelato. In Florence. In Italy. Hmm. 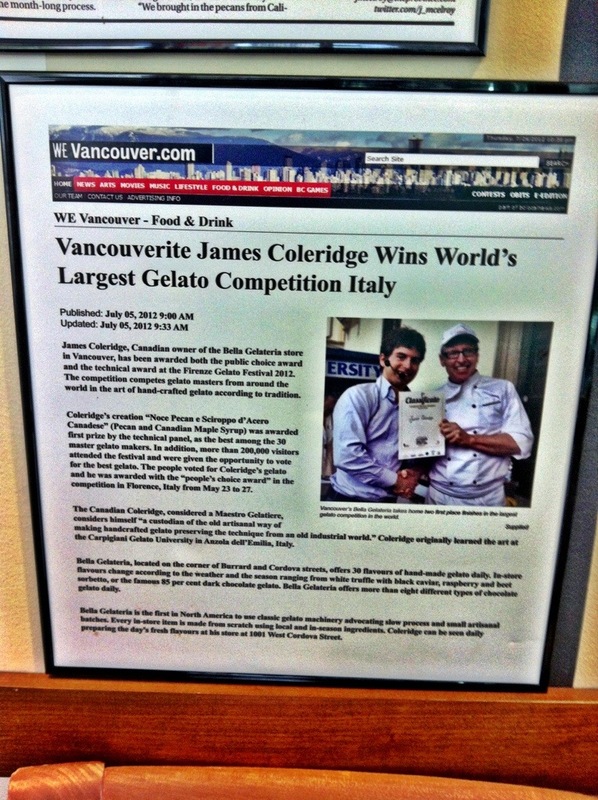 Today I went to Bella Gelateria run by James Coleridge in downtown Vancouver. Folks had mentioned this Gelateria to me but I had dismissed them – What would Vancouverites know about authentic gelato? I became such a gelato snob/conoisseur, that for a real treat I would make excuses to take the train to Rome to sh-lurp away at San Crispino (not then found in the travel guides). San Crispino behind the Fontana Di Trevi is usually passed over by the unsuspecting traveler. They are looking for colorful ubiquitous mounds of frozen delight, gloriously decorated with delectable delicacies. San Crispino doesn’t display their gelato but covers it up. So much that is worth waiting for is initially hidden. The first thing that struck me at the Bella Gelateria was that like Rome’s San Crispino, the gelato was covered, not displayed. This minimizes air exposure and flavour-mixing. I had to admit that I was impressed. Maybe James Coleridge really knew something about gelato. He does. 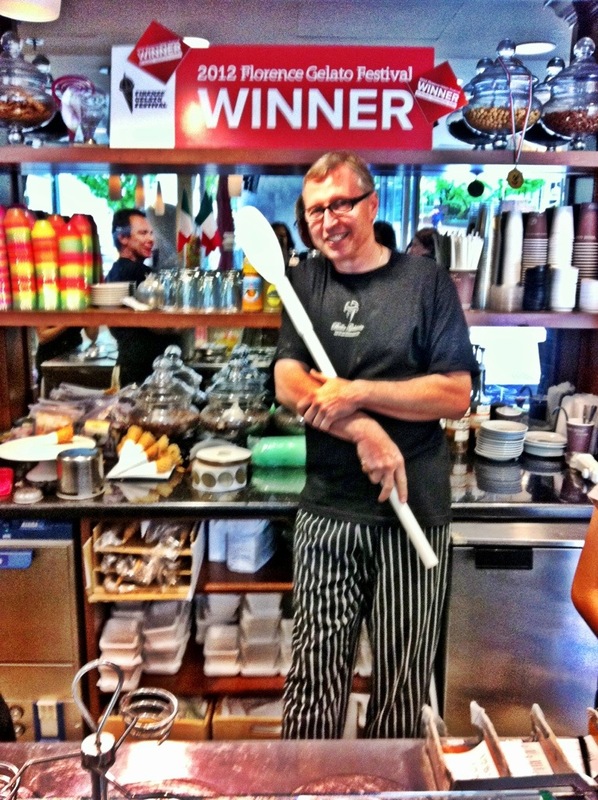 He is worthy of his title and wins in 2 categories of the International Gelato competition last year. He makes speechlessly-divine gelato. World Class. I asked him this afternoon about it. James said it’s like David and Goliath. An independent against the industrial machine. I’ve heard my father use the same analogy about making organic breakfast cereal. We inhabit a world where flavour is generally sacrificed for cost. It takes a true artist to attain perfection in the flavour department. Flavour perfection is almost invariably tied to pure ingredients. In this weird world where quantity too often trumps quality, James has distilled pure gelato magic. His mandate is to bring genuine flavours back into our culinary repertoire. Like fast fashion I’ve written about, fast food is even worse. On a meta level, who cares about how you dress if inside you are full of artificial flavours, artificial colours, GMOs and toxic residues? James is attempting to reconnect us with truth. 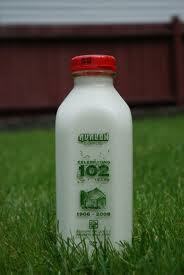 The maestro uses Avalon milk for goodness sake. I needed to post about James’s gelato for a few reasons. My noble goal is to highlight people and systems who are getting it right. By worshipping the good and great, by drawing energy to that, we can’t help but inspire change. James is my hero of the day. First, he makes incomparable gelato. Second, he doesn’t compromise quality. He exemplifies what we all must strive to: independence, pride in our work, love of what we make and what we give to others. I heard Vandana Shiva say that our greatness should be judged by what we create. I agree. James Colergidge, alchemist, is transforming gems of nature and augmenting them for our tastebuds. He is creating beauty one cone at a time. I left James with a “Ciao”, feeling I had met a great man today. This entry was posted in Food heros and tagged Badiani, Bella Gelateria, Cavini, David and Goliath, Florence, Gelato, gelato magic, gelato nazis, George Bernard Shaw, James Coleridge, Le Cure, quality, Rome, Scarperia, the greatness of a man, Vancouver, Vandana Shiva on May 13, 2013 by Gurdeep Stephens.